The VK2100 works as the main controller that provides great connectivity to all sorts of hardware devices commonly seen in a room. After connecting the hardware, the VK6000 software allows customizable device configuration via creation of a simple system project in 4 easy steps. By connecting to the VK2100 via Ethernet, the ATEN Control System App empowers you with the mobility to control different hardware devices in different rooms whenever and however you like. 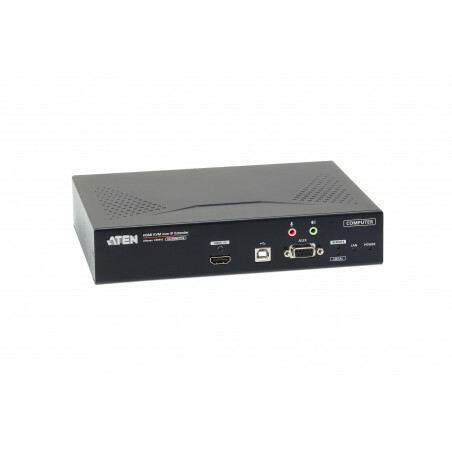 The VK2100 can easily deploy into an existing installation and integrate seamlessly with ATEN VanCryst pro-A/V products and a complete line of hardware devices, including A/V equipments, lighting systems, air conditioning, motion sensors, power switches and much more. The VK2100 serves as a centralized platform where hardware devices are converged to be monitored, managed and controlled directly via a tailored-made GUI from an iPad. The VK6000 features a quick setup that facilitates the configuration of hardware control and device operations in 4 easy steps via an intuitive GUI. Through Ethernet connection, the ATEN Control System App enables you to import and update viewer profiles from the VK2100 via point-n-tap user interface. Each viewer profile provides a customized control GUI that grants you quick access to target hardware device. Use of any profile is further protected with password authentication to secure system access. The ATEN Control System is perfectly applicable in meeting rooms, conference centers, boardrooms, classrooms or any room that requires collaboration of a variety of hardware devices through a streamlined management with optimum efficiency and performance.